September has turned out to be a pretty good month for magazine freebies; as well as the Balance Me Super Moisturising Hand Cream I reviewed a few days ago, you can also get your hands on two variants of Neal's Yard Remedies Body Lotions with the October issue of InStyle. I picked up one each of the Bee Lovely and Geranium & Orange options, so here are my thoughts - just in time to pick up a tube or two, if they take your fancy!! Both come in a squeezy plastic tube with screw-cap, with the Bee Lovely tube being a pretty sunshine-yellow colour with a honeycomb design and cute little bees, whilst the Geranium & Orange is a more mature-looking lilac and navy. The tubes are great for travelling with - indeed, I'm keeping the Geranium & Orange in my gym bag - so it's worth noting that the full-sized products actually come in a bottle with a pump, which might not be quite so handy for on the go, but would be easy to use with wet hands after a bath or shower. Swings and roundabouts. 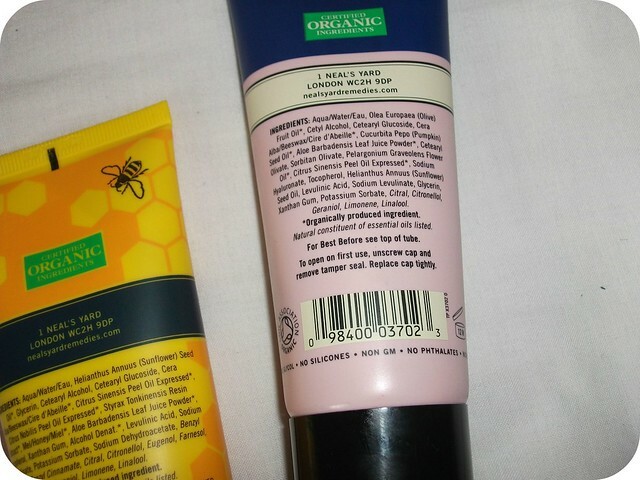 Neal's Yard Remedies describe the Bee Lovely lotion as follows: "Moisturising organic honey is blended with energising organic Orange and Mandarin oils to nourish, soften and bee-utifully scent the skin", whilst the Geranium & Orange, "Combines vitamin-rich Olive and Pumpkin Seed oils with soothing Aloe Vera and pure essential oils of Geranium and Orange to leave skin velvety smooth and delightfully fragrant." With a base of natural oils and beeswax, you can expect these to be super-nourishing on even the driest of skins. 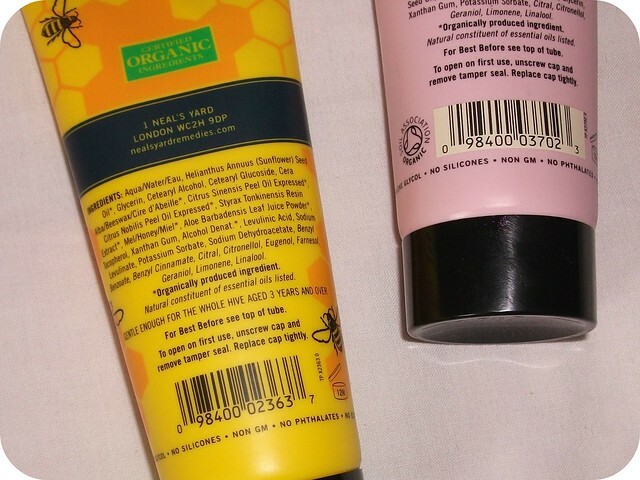 Having a little look at the ingredients, however, I was surprised to note that the Bee Lovely lotion does contain Alcohol Denat. which is quite a drying form of alcohol and not one I'd expect from Neal's Yard, so if your skin is on the dry side I'd be careful with that and maybe opt for the Geranium & Orange instead. 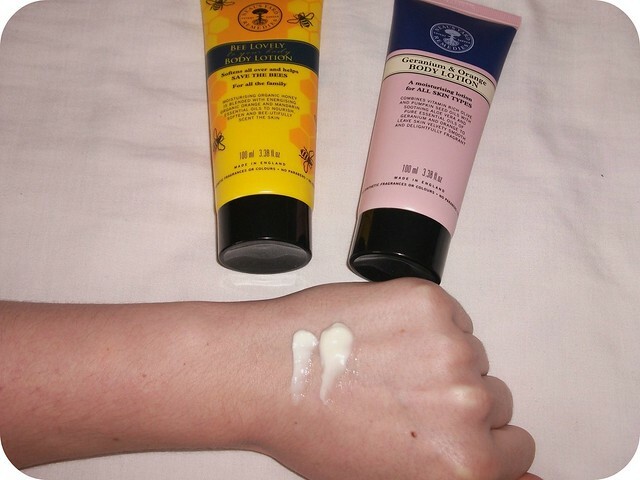 Both lotions are white and creamy upon squeezing from the tube; if anything, I'd say that the Bee Lovely lotion (on the left below) is ever so slightly thicker than the Geranium & Orange (on the right), but I only noticed when I compared the two side-by-side - I don't think I'd notice in day-to-day use. Both spread easily over the skin and absorb quickly, leaving my skin feeling hydrated, soft and smooth but not sticky or greasy. Both leave behind a lovely, delicate scent which has me sniffing my arms for the next few hours..! Neither has an overwhelming scent - both are subtle and "just enough", if that makes sense; the Bee Lovely has a refreshing yet grown-up citrus scent which is just gorgeous, whilst the Geranium & Orange lotion is a predominantly citrus scent with undertones of geranium which, again, is really lovely. I've found both body lotions work equally well to hydrate my often tight and dry skin, leaving behind a subtle scent that hasn't irritated my eczema at all. Neal's Yard Remedies Bee Lovely Body Lotion and Geranium & Orange Body Lotion are priced at £21.50 for 200ml, but you can currently get a 100ml tube for just £3.99 with the October issue of InStyle which will be around for another week or so - I'd definitely recommend searching a copy down if you like the sound of these, as that's a right bargain! 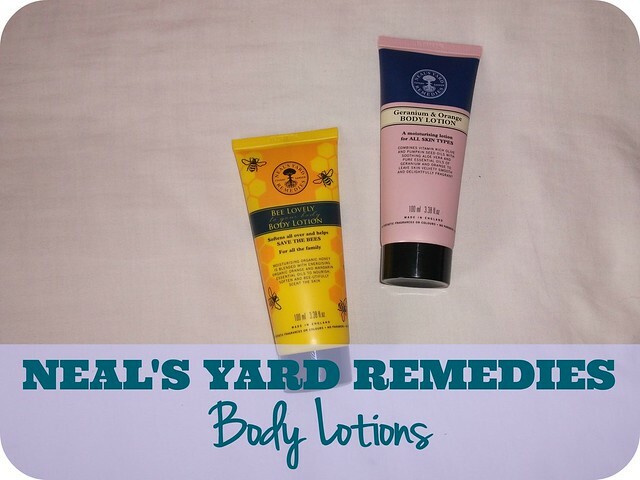 Did you pick up either of these Neal's Yard Body Lotions? Which do you like the sound of most?